Recently in Rheumatoid Arthritis Ultrasound News, we looked at reasons musculoskeletal ultrasound matters to people with Rheumatoid Disease (PRD), and stories from patients who weren’t treated because doctors didn’t see swelling or inflammation. We heard what a doctor said recently at EULAR: “You can see raging inflammation in joints that are not swollen or tender,” and reasons musculoskeletal ultrasound (MSUS) is not available to most PRD in the U.S. In part 2, Musculoskeletal Ultrasound in Rheumatoid Arthritis: Training Is Essential, we saw even a trained ultrasound technologist confused by the latest in MSUS technology and techniques, and bad things that can happen when MSUS is in the hands of improperly trained doctors. We’ve seen ultrasound is proven superior to “clinical exams” in PRD in many ways, such as in detecting erosion and inflammation. However, proper training is critical to keep this valuable tool from becoming a weapon to refuse treatment the way other tools have, such as blood tests, and nuclear bone scans. 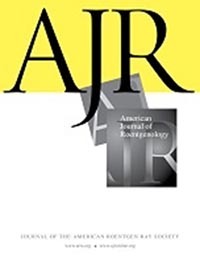 The American Roentgen Ray Society, the oldest radiology organization in the U.S., published this five years ago: The Top 10 Reasons Musculoskeletal Sonography Is an Important Complementary or Alternative Technique to MRI. It’s full of examples and images and not difficult to read. There are still few trained in MSUS, but it sounds like the ARRS recognizes its importance. 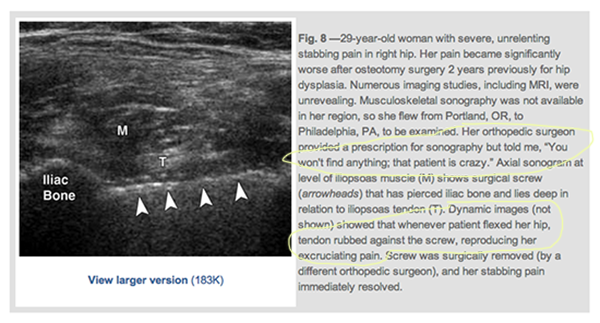 In one example, Nazarian tells us of a woman with hip pain: “Her orthopedic surgeon provided a prescription for sonography but told me, ‘You won’t find anything; that patient is crazy.’” In reality, a surgical screw had pierced the iliac bone and it pressed against a tendon when she moved. She wasn’t crazy or even wrong! Her doctors needed to trust her word, and pursue an answer. The screw was removed by a new surgeon. To those of us with “invisible” symptoms, this should be music to the ears – clinicians who want to find answers instead of dismiss us with a syndrome-of-the-day! In “Good” Patients and “Difficult” Patients — Rethinking Our Definitions, a moving story in the New England Journal of Medicine this week, by a doctor tells of saving her dad’s life one night in the hospital when the staff was oblivious to his internal bleeding. Ironically, the patient was a doctor too, but it doesn’t seem to matter much once you become a patient (as Elizabeth Cohen’s book demonstrated). Nazarian’s reason four includes an example of a rose thorn inside a patient’s finger, which MRI failed to show. Placing an ultrasound probe where it hurts showed a “foreign body consistent with rose thorn and proven at surgery.” Seeing that thorn reminded me of when Katie Beth was 2 years old. I took her to the doctor for a splinter in her foot. Nothing was obvious, so we were told that if anything were in her foot, “her body would take care of it.” Her foot continued to hurt, but our complaints fell on deaf ears at periodic pediatrician visits (in another state – not the wonderful ped we’ve had the last 8 years). Eventually, a new doctor recognized that there was a problem, and sent her for an x-ray. Then she had surgery to remove a piece of metal from her foot, and she stopped limping. The steep learning curve is worth it! For the 2012 annual scientific meeting, the American College of Rheumatology published 58 abstracts on the subject of ultrasound. Another organization, the Targeted Ultrasound Initiative understands the value of MSUS and the need for training. Their steering committee includes some of the developers of MSUS techniques. Postblog: Does it matter who does MSUS for PRD? To obtain a diagnosis, probably not. But to get the best care possible, PRD need clinicians who are conscious of their ongoing disease activity. It’s ideal if MSUS is available each time a patient is seen. However, any access to MSUS would be an improvement for most PRD in the U.S. and they should seek care from whichever clinician is equipped to use it. Another tour de force, Kelly. I admire deeply your ability to collect information, express feelings, write clearly and compelling, and point to why it matters. That’s what the best change agents do, and you’re tops. Question: do we know if the original “she’s crazy” doc was notified of the finding? In my view it makes a world of difference whether a mistaken person responds to new info with “Holy cow, I’m sorry!” or stonewalls it. Anyone who stonewalls in the face of new info is no scientist – even though it’s a common situation. If only there were a list online of doctors or practices who are proficient and proactive in the use of MSUS for folks like us, so that they could receive more patients, and so that those who do not could be embarassed and avoided. And hopefully change. I love your idea of a list by state of those who provide MSUS or advanced imaging. I wonder if this suggestion is in the works or if people are needed to help this become a reality. I hope people will become members and volunteer with the Rheumatoid Patient Foundation. I also encourage people to help achieve the goal of having advanced imaging be the “standard of care” in rheumatology. I just posted on actions that can be taken from my perspective. North America has a long way to go to have advanced imaging become the standard of care. We are far behind Europe with this practice. Frankly, I’m tired of hearing the poor treatment of people with RA and want to help bring about positive change. Thank you Kelly for staying active and pushing for reform in all aspects of Rheumatoid Arthritis diagnosing and treatment. Dave above makes some excellent points. I am RH negative and have been brushed off by so many doctors over the years that currently I am not seeing any doctors for the treatment of my RA. I have been dismissed by RA doctors since I don’t show the typical blood work responses; MRI’s and Xrays. Having said this, I find it interesting that when I consulted with a shoulder specialist for Rotator cuff tear he immediately noted through his Xray and later ultrasound tests that I had severe bone erosion on both my shoulders and feet all typical of RA! Funny how this isn’t even his specialty! Thanks Kelly for a wonderful 3-part series. It looks like you and I are equally passionate about raising awareness of the critical importance of power doppler ultrasound and MRI in rheumatology care. I’m glad the American College of Rheumatology has courses for rheumatologists and sessions at the upcoming ACR Conference on advanced imaging. There are several things people with RA can do to help move rheumatology to accept advanced imaging as the “standard of care”. 1) As awareness is increased among us, it is sooooooo important that each person ASK their rheumatologist for a power doppler ultrasound or MRI of at least both hands and feet or if you have a joint that is particularly concerning, mention that, also. Hands and feet are the two recommended minimum areas for imaging in the published literature on ultrasound. WE have to advocate for the best diagnostic tests available. People with the conditions or disabilities are the ones to change the face of treatment and improve their own lives. So, even if your rheumatologist says “no” we don’t have that or I don’t believe in that or whatever……….. the question has been asked, the awareness has been raised of this need BY PEOPLE WITH RA who want good treatment. Everyone should be sick and tired of being questioned about if their joints are really swollen or not, if their joints really hurt or not when objective tests exist to PROVE the disease activity in the joints. X-rays do NOT show inflammation and only show damage several years after damage has occurred. DON’T SETTLE FOR POOR TREATMENT !!! 3) Write to the American College of Rheumatology or other professional association of rheumatologists thanking them for their training opportunities for rheumatologists and their courses on MSUS. Ask that advanced imaging become the “standard of care” in rheumatology. Ask where you can have the imaging done in your state or province. I can provide you a sample letter if you’d like just personal message me. 4) Share the information Kelly is providing on RA Warrior with your contacts in the rheumatology community. 5) Print out the extensive references we’ve posted about MRI and power doppler ultrasound and share these references with your rheumatologist. The references are available on Kelly’s posts or on the comments section by others who post. I can send my own references to those who would like. Thanks for the link to the NEJM article on good and difficult patients. As someone who has been in both the role of health care worker but also been in the role of a “difficult” patient, I found this a wonderful article. Great series of articles and the comments as well! Thank you. I may have missed this – but what is the protocol for xrays, u/s, mri or whatever. My first rheum did xrays on my hands once a year. Current rheum has never made one xray or anything else in over 2 years. Thank you Kelly, for all the current info you keep pointing out to us. Because you mentioned it (maybe last year? ), I knew on my first visit that my rheumatologist might be a keeper. He did look at my labs, did squeeze my joints etc. but he also did ultrasound of my hand joints. He took the most normal looking joints and pointed out what the structures are, then looked at the ring fingers which are noticeably deformed, and pointed out the difference. It looks like there is a storm in the ring finger joints. So I didn’t have any questioning of my sanity or symptoms, or a delay in treatment. I think this helped me to be a better patient, along with the wealth of other info you put up here. And by “good patient” I mean not submissive or doing whatever the doctor says, I mean communicating clearly, paying attention to the treatment plan and taking the meds correctly, while letting the doc know what’s good and not good so the treatment plan can change if needed. It’s taken a chronic disease to make me into a little more assertive patient, and I am thoroughly grateful for the community of patients that share their experiences. I have to admit I was skeptical when my rheumatologist starting using ultrasound on every visit (every 3 months). I thought this might be simply another way for him to increase his billing fee. (I still feel this way somewhat about Dexa scans.) But my experience is now that the ultrasound correlates with the way I am feeling the rheumatoid disease better than any other diagnostic I’ve had in my many years of having RA. My rheumatologist has been able to adjust my medication (Cimzia + methotrexate) to the minimum level that keeps me relatively comfortable.